Like a lot of you, we have several wall-mounted LCD HDTVs in the house. The TVs have two wires -- power and HDMI -- running down the wall to the power outlet and cable box. I've historically been too timid to try to run the wiring inside the drywall and too cheap to pay someone to do it... and I'm hoping diy.stackexchange.com can come to the rescue. What is the easiest and least-destrictive way to run cables from behind the TV (about 4-6 feet high, depending) to the electrical junction boxes on the floor (usually about 3-4 inches high). Removing and then patching large swaths of drywall. I would like to keep any drywall holes to a size that can be repaired with a small drywall patch kit. Installing an electrical junction box behind the TV. I'm not an electrician and this scares me. Also, it doesn't help with the HDMI table. Is this possible for a novice DIYer, or do I need to call in a professional? @Jeremy has a good solution, but if you're willing to do a little more work, there is a little better-looking answer. Since you're running an HDMI cable, I assume you have some kind of small stand/table in front of the outlet that your cable box sits in or on. 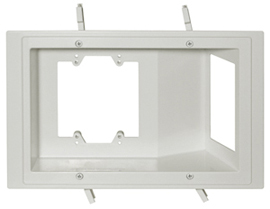 With a drywall knife, punch out a hole behind the TV and install a plastic "old-work" 1-gang box. Don't worry, we're not going to install electrics here; just a plastic box that has a couple of "ears" on it so it can slide into existing drywall. Do the same thing at the bottom of the wall, above your electrical outlet. You can now run the cables easily through the wall without patching any drywall. If everything's laid out correctly, both will be hidden (one by the TV, one by the stand/table that holds your cable box). 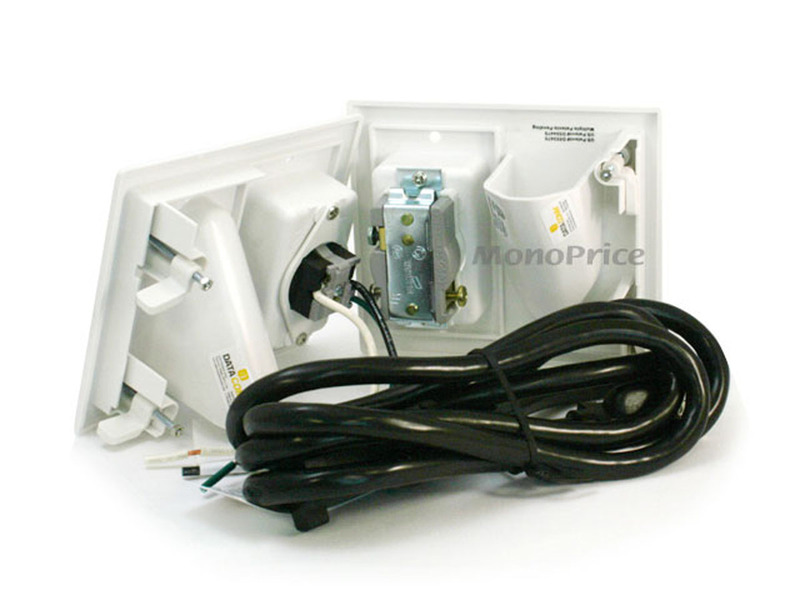 Monoprice has a complete kit that will allow you to cut two holes in the drywall, and then get power and also run your signal cables vertically. I believe you need to install an 'old work' (aka 'retrofit') box for the power side, but that is pretty straight forward. Once you cut the holes, these things fit in, and have wings that tighten down onto the drywall. Note that by code you're not allowed to run a device power cord behind the drywall. So if you want to stay in code (and there are many good reasons for doing so), then your two options are going to be either 1) conceal these cables on the outside of the wall using a surface-mount conduit as suggested by Jeremy McGee and Gordon Brandly, or 2) install a power outlet in a standard (non low-voltage) old-work box behind the TV. Personally I like gregmac's solution -- you'd still need to install two standard boxes and run a bit of romex up the wall, but you don't need to run it across the wall and tie it in to an existing outlet for power. The electrical skill needed for this would be similar to replacing a light fixture -- a couple of wire nuts and a couple of screw terminals. You can do it! The extension cord will look a little funny running from one outlet to another on your wall, but hopefully that'll be concealed by whatever furniture you have below. The really really easy way to do this is to use trunking: this is plastic square conduit, with a lid on the fourth side. Some makes are even self-adhesive: take off the lid, place the trunking on the wall where you want it, slip the wires inside, replace the lid, job done. For example: Amazon do this. I can understand being concerned with running electrical, but low voltage is a snap, as you don't have to install boxes in the walls. You can get the necessary equipment to install low-voltage wall plates at most home improvement stores. You'll need the wall plate, the correct inserts for it (they make 'em for F connectors (cable TV), RJ45 (twisted pair ethernet), RJ11 (phone), RCA plugs, and some can take extra wide inserts for HDMI, blanks to fill in any holes you won't be using, and a wall insert thing (not sure what it's officially called; it goes into the wall cavity to give you something to screw the wall plate down to. You hold the insert where you want it (which is anywhere there isn't a stud, pipes, or electrial), trace it on the wall, then cut out with a drywall saw. Afix the insert. You can then fish the lines through the wall cavity. As we're not trying to go horizontal, you can just use a decent sized nut tied to the end of a piece of string. Dangle it down, and grab it when it's at the lower hole. If you're trying to get it into a very small lower hole, or it's not exactly lined up with the other one and your hands aren't small enough, bend a wire coat hanger into a hook to grab the string. (note -- you want the string more than 2x the length you're going ... so you use one hand to wiggle the string if needed, while catching it with the other one. Once you have the string fished through, tie the top end to something (you can temporarily place a bolt for the face plate into the wall insert, and tie off to that). Remove the nut from the lower end and tie it onto the cables you're fishing. Pull the string to bring the cables up. Attach the cables to the inside of the prepared faceplate. Bolt the faceplate to the wall. Do whatever you need to do to terminate the stuff down below, and you're done. That Monoprice kit isn't too bad, but seems a bit pricey for what you get. If you are willing to bite the bullet and wire up just one outlet, I highly recommend this recessed wall box. You wire up the power using a standard electrical box, but it fits better behind the TV because it's at an angle. You can also use whatever wall plates in there that you want. I like the flexibility of the Keystone system, so I used a couple of 6-port Decora Keystone plates, so I could put in both coax and component video and RCA audio, with room for expansion if I ever decide to run another device to the TV. Of course, running the cables is never exactly fun, but it's not too bad if you have a fish tape and a little patience, and this wall box at least gives you a little bit larger target. While Jeremy's answer about the Wiremold products is a good one, for aesthetics I'd recommend the same manufacturer's CordMate product. I've used both types, but in the house where people can see it, I prefer the look of the CordMate. The only drawback is that you can usually only run one cord through one CordMate (though two pairs of speaker wires will fit in one.) For instance, I've run two CordMate channels side by side down the wall from our wall-mount TV; one for power and one for the cable connection. I painted the CordMates when I recently repainted that wall, and they look good -- I think they're less noticable that the big Wiremold channels. I've also used a CordMate at work to hide the Ethernet cable that runs down my office wall -- even unpainted, it's hardly noticeable. 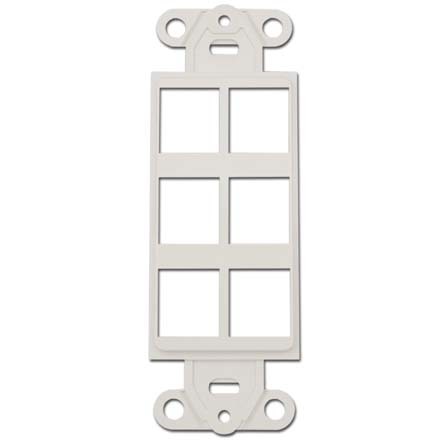 Sewell Direct recently started selling their Recessed Wall Plate Kit. 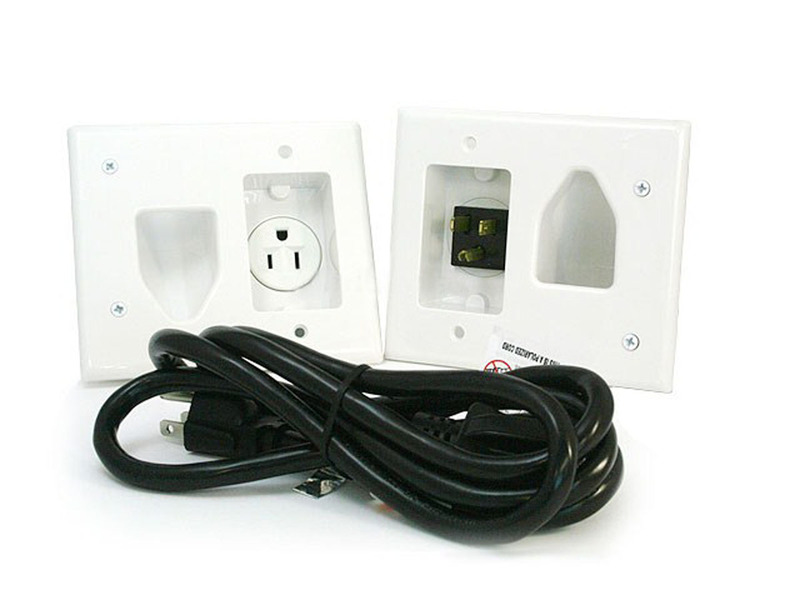 The kit comes with two wall plates to give quick access to drop cables down inside the wall. It includes a power cable to run between the two plates, as well as the power cable to connect to a standard outlet. You can view images at their site. I installed it and it was very simple to do. It doesn't require an electrician to install it. Just get a drywall knife and a screwdriver. Finish by watching the Youtube Tutorial of installing it. Not the answer you're looking for? Browse other questions tagged electrical walls drywall or ask your own question. What fire hazard considerations are there when creating a cable hole between rooms? What is the best option for hiding wires to wall mounted TV? Is it safe to mount a surge protector strip behind a wall-mounted television? How can I mount an electrical box to exterior foam board? What is the proper way to power an in wall monitor for a new construction home? How to move outlet in wall?